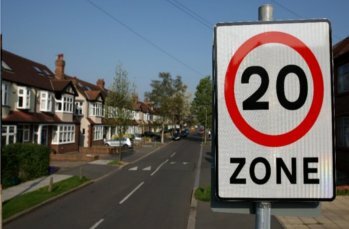 A long-awaited evaluation of the use of 20mph limit schemes has failed to find evidence of a significant short-term impact on safety but said they could provide other benefits, including promoting active travel. The Department for Transport has published a report the effectiveness of 20mph speed limit (signed only) schemes, which it commissioned in 2014 from Atkins (as lead consultant), Aecom and Professor Mike Maher of University College London. The report’s overall conclusion on the schemes’ impacts on collisions and casualties, was that the evidence available to date shows no significant change in the short-term in the majority of the case studies, albeit with some evidence to suggest a positive impact in one location (Brighton). However the majority of 20mph case studies were implemented on roads where the average speed prior to implementation was typically less than 24mph, and where the schemes would be self-enforcing, with no expectation of additional police enforcement. In this context the report found that following implementation ‘a substantial proportion’ of drivers are exceeding the 20mph limit, with 47% of drivers in residential areas and 65% of drivers in city centre areas (equating to 51% across both categories) complying. The report pointed out that accident reduction was not a key driver behind many of the case study schemes and that in general, 20mph limit schemes seek to address a wide range of policy areas and have a range of objectives spanning road safety, promotion of active travel modes, perceived quality of the environment, health and wellbeing, and community benefits. It found that overall, 20mph limits are perceived to be beneficial for cyclists and pedestrians, with 69% of residents agreeing that the limits are beneficial for cyclists and pedestrians and 74% and 77% respectively of non-resident drivers agreeing that they are beneficial for cyclists and pedestrians . The 20’s Plenty for Us campaign said: ‘There are some useful indicators in the report, particularly around the negative aspects of police failing to routinely enforce 20mph limits and the need for national engagement and awareness on the benefits of reducing speeds below 30mph in residential and other roads.